Welcome to Cub Scout Pack 374! We are the largest and most active Cub Scout Pack in Menifee, California, delivering a quality program by award-winning volunteer leaders. We are an active family-oriented pack for boys and girls in 1st through 5th grade. Look at all the fun in 2018! CLICK HERE to visit the web site for Scouts BSA Troop 374. CLICK HERE to visit the web site for Scouts BSA Troop 584. 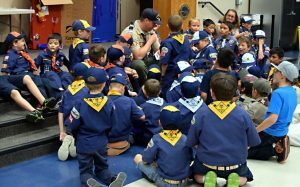 Pack 374 is Menifee’s largest and most active Cub Scout pack. We are chartered by VFW Post 1956. We are primarily composed of boys and girls that attend Ridgemoor Elementary School and Taawila Elementary School and live in the neighborhoods of Menifee, Newport Hills, Sun City, and Audie Murphy Ranch. We accept children from any school and any neighborhood; if you want to be part of Pack 374 you are welcome here!